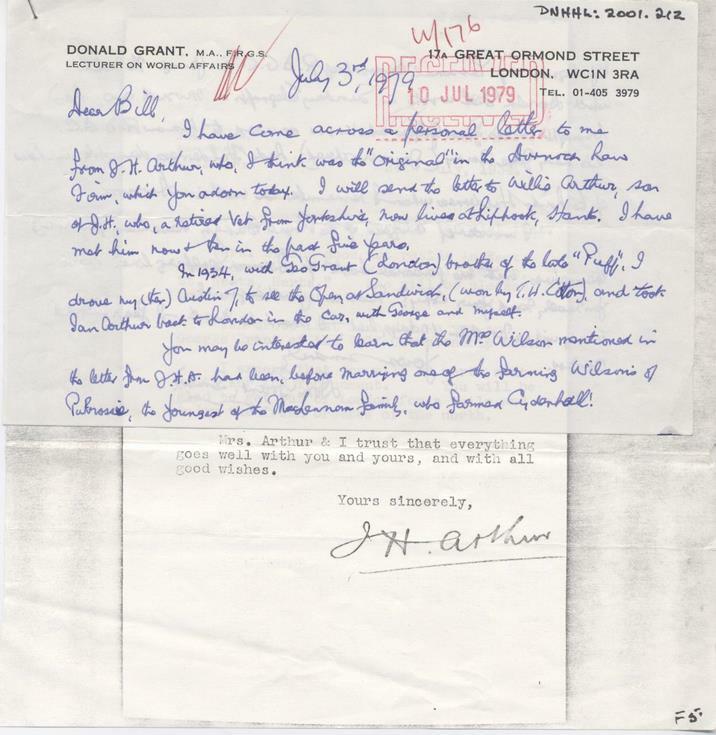 Letter to Bill Wright of Arthur & Carmichael, solicitors, dated 1979, from Donald Grant, London, relating to a golf tournament of 1934, with attached photocopy of a letter of 1934 to which he refers. 2 pages stapled. Letter on headed paper sent from address 17a Great Ormond Street, London and mentions a Mrs Wilson (also in original letter) who was married to the farming Wilsons of Pulrossie and came from the MacLennon family who farmed Cyderhall. This was the same Donald Grant who can be seen in photos: 255, 345 and 12439. He was witness at my parents wedding in London and whenever me and my parents go to Great Ormond Street Hospital for my sister's remembrance we pass 17a Great Ormond Street to look at that building where Donald Grant lived. - many thanks for your comment. - Administrator.